Does EuroMillions Play Really Work? Read Reviews! EuroMillions Play is downloadable software that enables you to improve your odds of winning a EuroMillions prize through the selection of the right numbers. 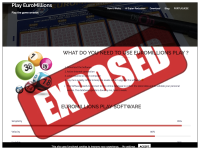 EuroMillions Play Exposed — A Revolutionary AI Lotto Predictor in the Making? Everybody dreams secretly of winning the lottery, even if they don’t admit it. Multiple systems and tools have been developed for the purpose. EuroMillions Play is one of the programs that supposedly makes it possible for players to improve their chances of claiming a prize. As the name suggests, this tool is tailored to a single game – EuroMillions. If you’re a fan of one of Europe’s biggest lotteries, you’ll definitely want to find out whether EuroMillions Play delivers on its promises. What Is EuroMillions Play and What Does It Do? The EuroMillions Play software is to be downloaded to your computer and installed before you can begin testing its features. An active internet connection will also be required to make the predictive tool work. According to the official presentation, you have to follow three steps in order to utilize the tool. 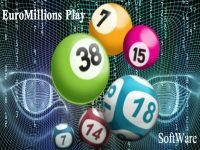 Choose your favorite EuroMillions numbers, select the desired filters via the software and get a suggestion that’s supposedly based on an artificial intelligence (AI) algorithm. The aim of the algorithm is to improve your odds of winning through a number of filters – high numbers, low numbers, star, left-hand numbers, right-hand numbers and so on. You will need to go through the explanation in order to find out exactly what each filter entails. The developer of the software suggests that all of the filters should be activated for the prediction tool to deliver the best possible outcome. You can download the software for free and test it out. To get a serial number, however, you will be asked to make a so-called donation. The donation is paid via PayPal and it can range from two euro for a one-month access to 50 euro for unlimited access. At least you can see what you’re getting yourself into before you spend your hard-earned cash on yet another lottery system. How Does EuroMillions Play Work? It’s very difficult to reach a conclusion about the accuracy of the EuroMillions Play software. We did carry out thorough research but there’s simply no information about people who have downloaded the algorithm and applied it to the acquisition of their EuroMillions tickets. The AI super reduction algorithm, as the developer calls it, reduces the unfolding of possible EuroMillions combinations. It looks for numerical combinations that have a higher success level (a 99 percent success as per the official presentation) and these are utilized. A bold claim is made that the algorithm searches all the numbers drawn in the history of EuroMillions. Based on this information, a “persistent logic” can be achieved to give players better odds of selecting the digits that will result in success. Supposedly, the algorithm is smart enough to comb through large volumes of data and identify the logic that has contributed to the selection of the different winning numbers over time. Obviously, such an artificial intelligence development would be considered revolutionary. It is thus quite surprising that nobody has written about EuroMillions Play and there’s no information of people becoming millionaires via the use of the smart technology. The official presentation features several videos that supposedly test out the manner in which the algorithm works and that result in winning combinations. At the same time, a warning is provided that using EuroMillions Play does not guarantee a win. We’re receiving somewhat mixed signals, don’t you think? Obviously, the website does not guarantee a prize. Obviously, these precautionary legal terms come in sharp contrast with the confident presentation of the artificial intelligence algorithm. Keeping in mind the fact that the explanation of the AI tool is also pretty vague, you’re getting a more or less comprehensive picture of the trustworthiness of EuroMillions Play. Who Is Behind EuroMillions Play? The contact information on the website does not mention a company or a specific entity behind the algorithm. There’s simply a corporate email you can use to get in touch with the developer. An address and a telephone number are not provided. If you check the official videos featured on the EuroMillions Play website, you will reach the YouTube profile of Emidio Braga. Supposedly, Braga is an IT developer who likes coming up with new programs. In his bio, Braga states that he hasn’t come up with a revolutionary system aimed at cracking the EuroMillions code. At the same time, the system could supposedly help you win more money when playing the lottery. Thus, we can conclude that Emidio Braga doesn’t have an awful lot of experience with lotteries or winning strategies. He does not provide any evidence of the system being effective or of someone claiming any large sum through its use. We leave the conclusion to you. Would you mind rating EuroMillions Play? While EuroMillions Play isn’t as ridiculously overpriced as some of the other lottery algorithms out there, it doesn’t strike us as anything more innovative or more effective than the other platforms. If you want to check it out, you can do so by downloading the software and playing around with the filters before making a payment. People who are happy with the functionality and the results can next choose to make the “donation” and continue using EuroMillions Play. What we suspect, however, is that the program will not result in much higher odds of winning. So far, nobody has bragged of claiming the EuroMillions jackpot through the utilization of EuroMillions Play. If such a person does come forward, however, we promise to make an immediate amendment to this review. At the time being, the algorithm gets a 2 out of 10 stars rating.